Picture 1-1 shows the complete frame of our inspection system. 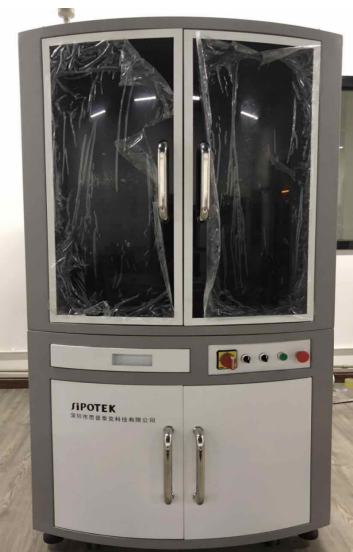 The whole machine is mainly composed of the overall frame structure, the Internal Host, the Light Source Controller, the Plc Control System, the Servo Motor, the Rotary Carrier, the Camera Bracket, the Image Acquisition Device and the Display Screen. The overall frame structure provides holding and protection for related devices inside. The Internal Host is mainly conducting image processing software system. The light source controller mainly controls the illumination of objects to be inspected. 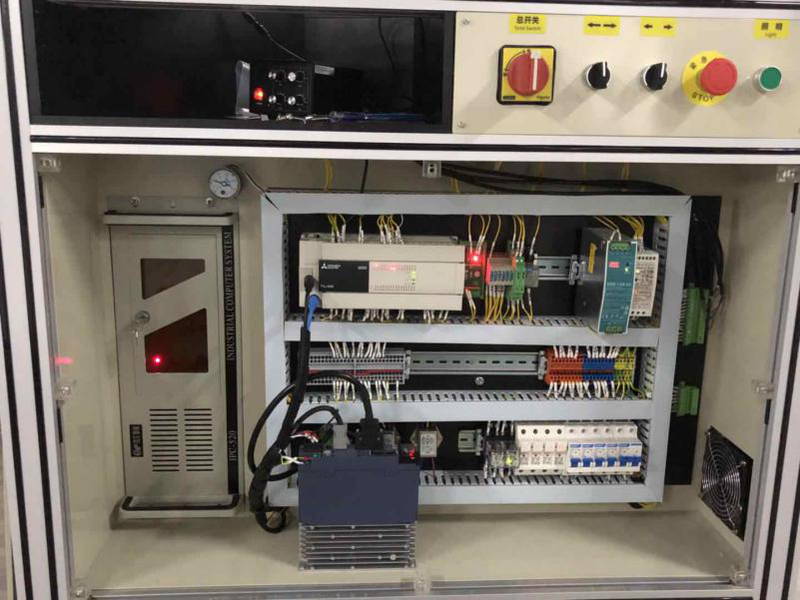 The Plc control system controls the start or stop action and rotary action of the servo motor, and take records for camera actions such as trigger and aspiration position. The servo motor is installed under the rotary carrier and control the motion of the carrier with adjustable speed. 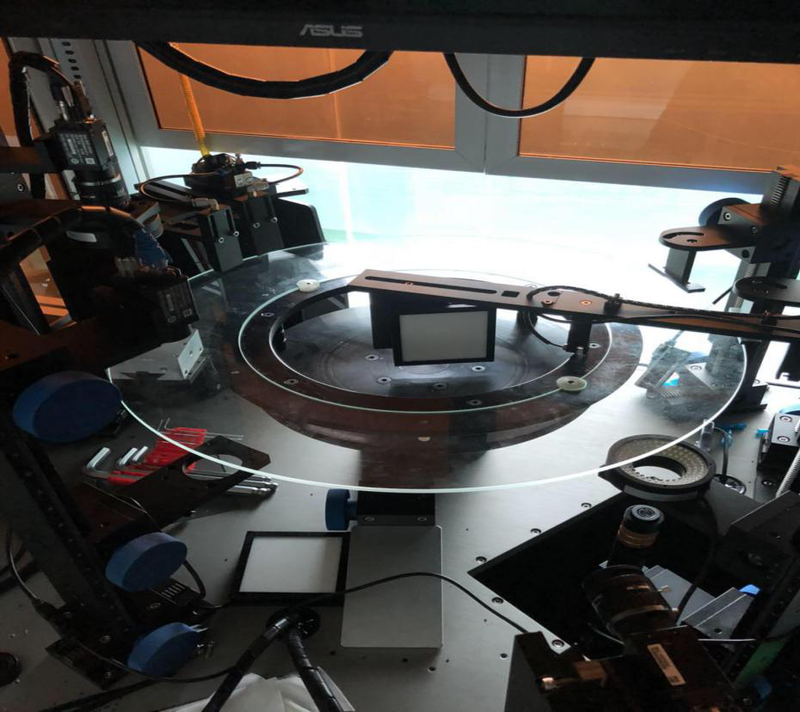 The rotary carrier is to carry the feeding objects from vibration feeder on the glass plate, then carry the objects to specific position where is ready for imaging acquisition, which will be transferred to the upside software system and being processing with results of good or negative. The camera brackets is used to support cameras on specific position. The Image Acquisition Device is composed of cameras and lenses. The Image processing software system evaluate images quality based on specific software setting. The display screen shows operation interface for image procedures and inspection results. We use the vibration feeder (Picture 1-2) to make objects ready and keep consistent for the next action. Then they will be carried to the rotary glass plate and reach a specific position for image processing. The rotary carrier (Picture 1-3) is also called a glass turntable plate. 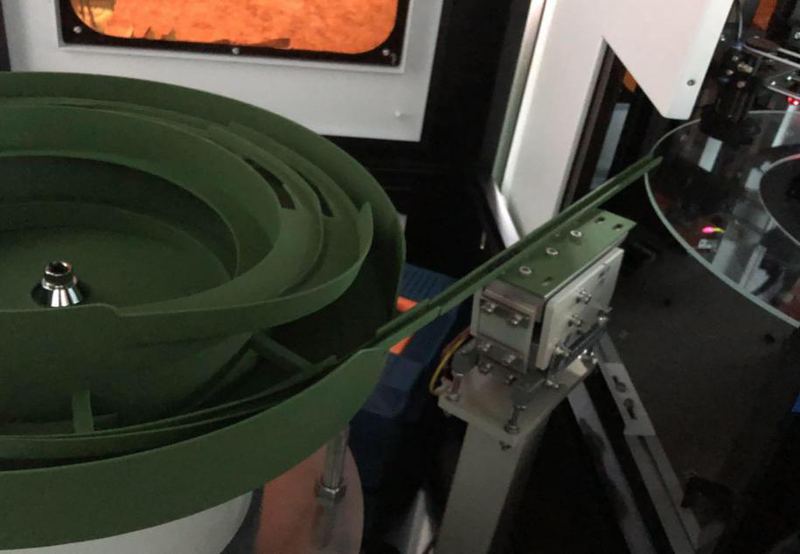 When the objects-to-be-inspected are carried through the vibration feeder to the rotary plate, they will be took photos by specific cameras in different position. Then the collect imaging data will be transmitted to the upside host computer software system and will be processed and evaluated with results, which will be transferred to the downside Plc control system that will take the sorting action via the nozzle to dived good or negative objects. As picture 1-3 shows, there are specific positions setting around the rotary carrier, where the cameras standby to take clear images under correct lighting source. The picture 1-4 shows the downside control system, including Plc controller, Servo motor drive, the Host, Power Source, the Servo motor and etc. In the working process, through specific operation of the upside control interface delivering actions to the downside Plc control system, the whole downside control system can adjust the turntable motion (forward rotation, reverse rotation, speed-change). Meanwhile the cameras are triggered by photoelectric sensor. A trigger signal is transmitted to Plc. Base on the time need for objects carrying to different camera positions, the Plc will finally determine the trigger time need for different cameras. Above mentioned is a brief introduction of our Optical sorting machine structure. Functions combination (Above mentioned functions can be combined to achieve multiple inspection and measurement task). All details above are the functions of our optical sorting machine. Some functions can be achieved by using the above mentioned software system. Including dimensional measurement (Circle inner and outer diameter, regular circle length/width, step height, step width), screw inner and outer dimension measurement, gearwheel/gear head/circle thread/root measurement, burrs inspection, surface dust, product completion detection (edge broken, part missing), surface scratches detection, character recognition, character inspection and etc. Through our inspection software system with combination of these functions, our optical segregation machine can achieve more functions on images-processing, inspection, measurement and recognition.